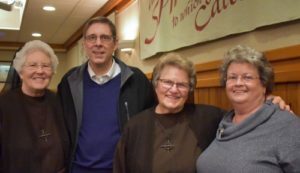 (L to R) Sister Mary Richards, FSE, Finance Manager, Franciscan Home Care and Hospice Care, Stephen Mysatyukow, Sister Suzanne Gross, FSE Administrator, and Rosemary Mysatyukow, at her recently held retirement party celebrating 23 years of service. Rosemary began as an administrative assistant to Sister Suzanne. As the agency grew and technology with it, she became the office manager and computer technology specialist. Rosemary was a dedicated employee and esteemed by her employer and her co-workers. Rosemary and Stephen reside in Meriden. They will continue to be involved with the Franciscan Sisters of the Eucharist, travel, and enjoy their mutual interests.